We need to measure at different scales of time and breadth across the system. We need individual snapshot measurements to capture a current state. We also need to monitor activity over time. For example, top to monitor activity and identify possible problems, and then ps to further investigate some processes. For storage I/O, we might start with system-wide monitoring with vmstat and see that there seems to be some problem. Then use iostat to see which file systems the problem is within. Then use iotop to see which processes are responsible. By default top will refresh its display every 3 seconds. This is a reasonable tradeoff, as the CPU is very fast so small sampling windows make sense, but displayed information moves around and changes and you need a chance to read something. You can adjust this with -d, including fractional timing. So -d 0.2 for 5 measurements per second to catch the thing that locks up your system. Here is a workstation running BOINC scientific compute jobs at very low priority (39, larger means lower priority) and with Firefox reloading 20 tabs simultaneously. The output starts with a system summary and then a table of processes. By default it sorts by CPU utilization. This is a 4-core system, so expect %CPU plus idle to sum to 400%. You can change the column by which the output is sorted with < and >. For example, press > once to sort by percentage of physical memory. Press 1 to toggle between one line summarizing all CPU statistics, versus one line per core. VIRT is total KiB of virtual memory allocated to the process. All code, data, and shared memory. RES is KiB of physical memory currently in use by the process. SHR is KiB of shared memory which should be shared with other processes (pages holding shared library code). Ask for one or more processes with -p PID[,PID2,...]. Here are just the Apache httpd daemons on a heavily loaded web server. The total CPU use isn't that much, but we will see below that disk I/O is saturated. The sysstat package and sar command can automatically collect and present information about system activity. It's a useful alternative to periodic captures with top in batch mode. Traditionally there have been two ps commands to measure the running processes. The SVR4 version used a POSIX-compliant dash with its options, the BSD version did not. The BSD version was usually more useful. SunOS and then Solaris provided both with /bin/ps and /usr/ucb/ps so the order of your PATH environment variable gave you one or the other by default. The GNU version of ps supports both, deciding which behavior to use based on whether you use a dash. Yes, you can mix both BSD and SVR4 options, the command will try to figure out a way of satisfying what you asked for and the result may be useful. You can ask for a "family tree" tracing the heritage of running processes. You can do this with the ps command or use the specially built pstree. You can accomplish an enormous variety of things with ps, explore its man page to learn much more. 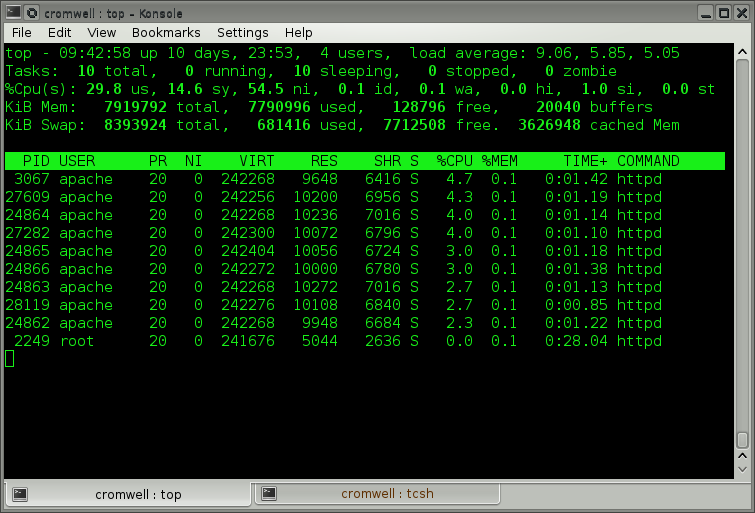 The vmstat command was intended to tell us about virtual memory use, as its name suggests. It isn't terribly useful for that directly, but it does show us about things bound by virtual memory. The important thing about vmstat is learning what to ignore. The first line of output is meant to be average since boot time, that is seldom of interest and I have more recently read that the data is not trustworthy even if you wanted it. Ignore the first line. Tell it how often to report with the number of seconds. If you want only a certain number of reports, specify that as a second number. Or just interrupt it with ^C. Here is example output for an overloaded system. I started this monitoring in one window, using -t to get timestamps. I removed YYYY-MM-DD from the timestamps and aligned columns for readability. During the period shown in yellow I ran something in another window to overload the system. What do we see? Disk I/O jumped way up, see bi and bo under io for blocks in and blocks out of storage. That caused a number of processes to become blocked waiting for I/O, see b under procs. Notice that the total number of active processes, those in the run queue plus those blocked or the sum of the first two columns, is much higher during that period. The blocked processes are forming a bottleneck. Notice how cache memory use increased as the web server processes read everything under /var/www/htdocs. Some free (really meaning "unused so far") and buffer memory was repurposed. By the way, something looks wrong here at first. 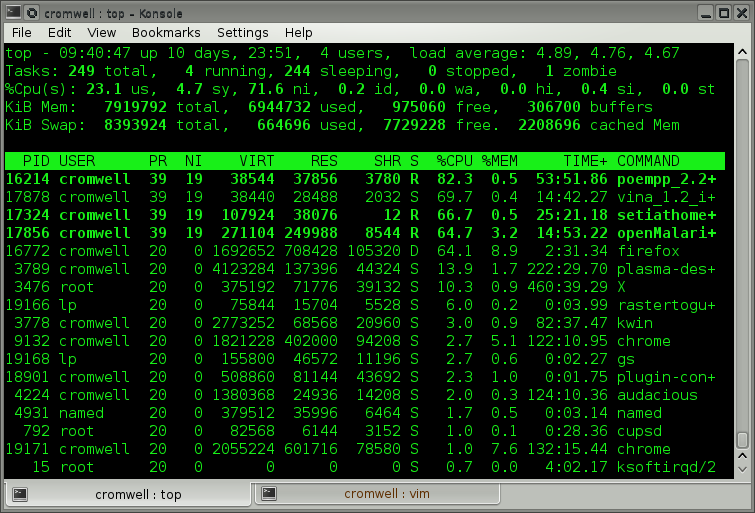 The wa column under cpu reports the percentage of time the CPU cores are in wait state, waiting for I/O. With 10 or more processes blocked waiting for I/O, it seems like that should be non-zero! But the BOINC processes can still run, the CPU cores are still over 89% busy running user processes (us), spending 5-11% of their time doing the system tasks (sy) of file system I/O. Just after 11:01:57 I started a script that ran 10 parallel wget commands to recursively read an entire web site. Those wget processes were started in the background so the script finished immediately. Then just after 11:03:17 I used pkill to terminate all running wget processes. The number of active processes goes back to just 4 BOINC compute jobs. The disk I/O doesn't finish flushing out for a while, I resisted the temptation to run the sync command. Without knowing the backstory, all we can tell is that some new processes did a lot of disk I/O making everything sluggish as processes blocked waiting on I/O. Now we can see that the surge in activity is reading from /dev/sdc1 and writing to /dev/sda6. We don't know what is causing the problem, but we can see how I/O is balanced across storage. Or in this case, not balanced. As for the backstory, /var/www is mounted on /dev/sdc1 and wget is writing those downloaded copies into /var/tmp, mounted on /dev/sda6. So far vmstat told us we have a problem and iostat told us where it is. But what is causing the problem? There is the problem. All those wget processes writing and httpd processes reading web pages and writing to the log. To verify that it's nearly zero overhead, read a gigabyte of zeros from one pseudo device and discard them into the other. This should finish in well under a second, even on a Raspberry Pi. To test TCP, use nc to establish a listening TCP service on one host, writing its output to /dev/null. Then from the other host use dd to read 1 GB of zeros out of /dev/zero and send it through nc and a TCP connection to the far end. To test TCP, do the above dd reads and writes, except use an NFS mounted area of the file system. SystemTap has a simple command line interface and scripting language for monitoring and analyzing operating system activity. It collects the same information you can get through top, ps, netstat, and iostat, but it adds further filtering and analysis. Valgrind helps application developers profile their code and detect memory management errors. Modern versions of Oracle RDBMS either sit on top of "normal, modern" filesystems (ZFS, XFS or Btrfs on Linux) and use some of their functionality (for example copy-on-write snapshots), or you can also use Automatic Storage Management (usually just referred to as ASM) which makes all of that management somewhat opaque to the DBA. All of the things that the Oracle kernel used to do is pretty common place in today's filesystems and storage systems for Linux and Solaris (logical volume management, striping, parity, snapshotting, replication, non-blocking backup, etc). As for swap, again, on "modern" machines, it's really not supposed to be used so much for a database workload. The SGA (shared global area) on a busy machine, with a large buffer pool can use quite a bit of memory, and thus back in the days of 32-bit addressing, or 64-bit but 4-8GB of RAM considered being "large", swap could help. However, the rule of thumb on commodity machines where you can install 10s of gigabytes of RAM, or even terabytes (in Sparc Supercluster or Exadata), is that if you've hit swap, you lose. The working set really should be fitting into RAM. On a server accepting many simultaneous connections, enable the recycling and fast reuse of TCP TIME_WAIT sockets with tcp_tw_recycle and tcp_tw_reuse. You might want to decrease the time the server is willing to wait in the FIN_WAIT_2 state, freeing memory for new connections. It defaults to 60 seconds, you might cut that in half with tcp_fin_timeout. But monitor carefully when experimenting with this value. If the server is heavily loaded, especially when clients have high latency, the number of half-open TCP connections can climb. Increase tcp_max_syn_backlog from its default to at least 4096. This page has shown you how to make a measurement. But you must be careful to collect and analyze that data carefully.